The basement bar has probably been around nearly as long as the basement itself. If you’ve decided to join this rich tradition by creating a bar in your basement, there’s plenty of good cheer ahead. But first, it’s important to do some advance planning –to make the design decisions that ensure your enjoyment of this new space. Most importantly, you’ll want to partner with a contractor who specializes in basement finishing. Don’t put the success of this basement transformation in the hands of a builder who only occasionally works in the basement. 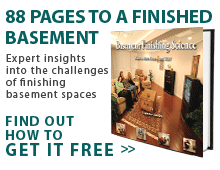 Go with a basement finishing expert like the folks at Total Basement Finishing. A generously-sized bar with a TV and comfortable barstools is a good beginning but for convenience, consider a bar sink and small fridge. Step #1 in planning a basement bar can be summarized in four words: Think about a sink. There's no doubt that a "wet" bar affords much more convenience than a bar without a sink. This plumbing will cost extra, of course. But if you're already planning on a basement bathroom, the extra cost for a small barkeep's sink will be negligible. It's usually smart to locate the sink close to the basement bathroom if possible, because the sink will probably need to drain into the same holding tank that serves the bathroom. You can install the sink in a basement wall, or it can be incorporated into the design of your bar, placed out of view below bartop level. Drawn a plan for your bar area to ¼-in. scale on graph paper. Allow 30-in. to 36-in. between bar counters and back bar. It's not easy to fit everything you want into the available floor space for your basement bar. This is especially true if your wish list includes a pool table, a large sofa, or a dart board with a fairly safe flight path. It's smart to make like an architect and draw up a floor plan of your basement. If you don't have a CAD program on your computer, just get some graph paper to make your scale drawing. Make cutouts of your major items (bar, couch, TV, etc.) so it's easy to move them around. With a working floor plan, you'll also be able to establish where ceiling lights, doorways and walls should be. There may be special considerations plumbing. This is where an experienced basement finishing expert can be a big help. Bar countertops may be made of stone, stone composite, solid surface, or wood. The latter is the least expensive but will require the application of a durable finish. There's no need to feel intimidated about designing the actual bar where you (the host) will be dispensing drinks and (hopefully) wisdom. From a construction point of view, a bar is simply a large cabinet with some special hardware and a distinctive top. Cabinet shops as well as hobbyist woodworkers have access to brass footrail hardware, bartop edge molding, ornate detail moldings (such as fluted pilasters and baseboard profiles) and even high-gloss bartop varnishes. Readymade bars are also available from some home furnishing suppliers. If you're building your bar from scratch (or having a cabinet shop handle the construction), first decide on the size and shape, and whether or not you want the bar to include a small sink and/or refrigerator. Then determine what type of wood and finish you'd like, and the material you want to use for the bartop. Although varnished wood is most popular bartop material, some people prefer plastic laminate, solid surface countertop material, or solid marble. SilverGlo™, attached to basement walls, will dramatically lower the need to heat your basement. To reduce sound transmission between the basement and floor above, fill joist bays with rock wool, also known as stone wool. An experienced basement finishing contractor is certain to mention the importance of insulation in the basement. Rigid foam insulation installed against or adjacent to foundation walls will make the basement more comfortable and more energy efficient. 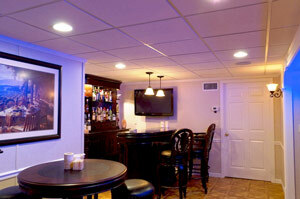 But you may also want to have sound insulation between your basement bar and the upstairs. There are different ways to acoustically isolate your basement from the rest of the house. Installing a suspended ceiling in the basement will provide a measure of sound insulation. So will insulated (foam-core) and weatherstripped doors, installed at the top of the basement stairs and on the bar's basement doorway. Talk to your contractor about these and other sound insulation options if you think your basement bar is destined to be unusually noisy. Near the bar area, choose a flooring that will be easy to clean. When planning a basement bar, it's a good idea to think ahead about what happens after you and a few friends get to enjoy this nice new space. That's right; someone has to clean up. There are a number of ways to keep your basement bar organized and simplify the cleanup process. Start by installing flooring that's durable, waterproof, stain-resistant and attractive to boot –TBF's ThermalDry® flooring fits the bill nicely (but don't use the carpeted ThermalDry® tiles). Incorporate a small closet into your bar's floor plan where you can keep cleaning supplies handy but out of sight. Spray-type cleaners, paper towels, rubber gloves and trash bags are in order; you might also consider a compact vacuum. Another must-have item is an ample rectangular rubber tub; you'll need this to transport dirty glasses and dishes upstairs for washing (unless your basement bar includes a dedicated dishwashing machine). Make provisions for storing beverages in bulk, but these drinks should also be out of sight, perhaps on closet shelves above your cleaning supplies. Dimmer switches are a must for bar areas. Use low-voltage, in-cabinet accent lights for decorative effect. It's easy to overlook the importance of good lighting. Taking the time to plan a suitable lighting scheme will make a huge difference in any basement bar. Start by identifying where you need task lighting –brighter light necessary for mixing drinks, reading, playing pool, using the bathroom or subjecting the dart board to close examination. It's a good idea to provide separate switches for task lights, since you probably don't want their bright, focused illumination all the time. The ambient or overall light in your bar can come from ceiling lights and from floor or table-mounted lamps. Put as many of your ambient lights on dimmer controls as possible. Dimming your ambient light enables you to control the mood in your bar. For the sake of energy efficiency, try to select compact fluorescent lights (CFLs) or LED lights rather than inefficient incandescent lights. Keep waterproofing equipment, such as sump pump and dehumidifier in a space that’s separate from the bar area. The SaniDry™ dehumidifier, with its powerful blower, may be vented to your bar area from an adjacent utility space. All of the basement finishing materials available from Basement Systems –flooring, wall panels, insulation, moldings, and ceiling panels—are designed to stand up to typical and even excessive moisture conditions in the basement. No matter how moist your basement gets, you'll never have to worry about these materials being damaged, supporting mold or deteriorating due to warping, cracking or rotting. But there will be many other items in a finished basement that aren't as moisture resistant –leather-covered furniture, books & magazines, fabrics and wood, for example. To eliminate the possibility of moisture-related damage, it's smart to have a dehumidifier in your basement. Not just any dehumidifier, but one that's designed to perform efficiently and reliably in the cool, humid basement environment. With a SaniDry™ dehumidifier from Basement Systems, you can be sure that you're getting the most efficient, most reliable performance available. This ENERGY STAR® appliance will drain automatically into a sump pump, and you can dial in the level of dehumidification you desire. So how do you go about bringing this distinctive new space into being? It's simple: Just complete the 7-step process described below. Start with the bar itself. Thanks to home furnishing catalogs and stores, it's possible to purchase a ready-made bar and bar stools that can serve as the focal point of your basement makeover. It's also possible to have a cabinet shop create a custom-built bar for your new basement space. Either way, look for durable, easy-to-clean surfaces, and sufficient space behind the bar for all the features you plan to incorporate (some of these are mentioned below). Find the right fridge. There are plenty of refrigerator options that will work well in a basement bar. For a retro theme, look for an old-fashioned fridge that can be given a bold, shiny finish to become a focal point in your basement bar. Alternatively, you can buy a small refrigerator that will just hold a couple of six-packs and stay out of sight behind your bar. Make sure that the wiring plan for your remodeled basement factors in the location of your fridge. Plan for bottles & cans. It's smart to have a plan for storing empty bottles and cans, and transporting these recyclables back upstairs. Depending on how your community recycling program works, you may need to get separate storage containers for glass, aluminum and plastic. Choose containers that aren't too big to carry easily. Plumbing is a nice option. Adding a sink to your basement bar and possibly a small bathroom definitely adds some expense to your basement makeover project. But this extra plumbing work makes your basement bar very self sufficient; there's no need for periodic trips upstairs. Thanks to special pumps and other innovations, basement bathrooms have become easier and more affordable to install, so this option is definitely worth considering. Where's the TV? A TV screen will turn your basement bar into a sports bar or even a home theatre. Thanks to flat-screen technology, even a large TV doesn't need to take up a great deal of space. Figure out where you want the TV to be located so that you can plan your wiring scheme accordingly. Score with the floor. Like any bar, your basement version will benefit from a finished floor that's durable, waterproof, easy to clean, and also pleasing to the eye. No product scores higher in all these areas than ThermalDry® flooring from Total Basement Finishing. ThermalDry® flooring tiles offer the appearance of different wood or tile floors with the durable, waterproof, maintenance-free characteristics of high-strength plastic. Get personal. Last but not least, you'll want to personalize your new basement hangout with pictures, pennants, trophies and other items that can be hung on the wall or displayed on shelves. If you've dealt with all the details mentioned above, you'll get plenty of satisfaction out of this final step. Now that the basement space planning is over, you will finally be able to enjoy your new basement bar, thanks to the basement experts at Total Basement Finishing.